Right now, Africa is the poorest continent in the world. Roughly 2-3% of global trade goes through Africa. The world GDP in 2011 was 69.6 trillion dollars, and yet that of the entire continent of Africa was 1.9 trillion dollars in 2011. This is 2.7% of global trade (IMF). How does an entire continent with all the world’s natural resources imaginable produce less than these two islands (UK and Japan)? The answer to this question is simple, these islands produce finished goods. They mainly produce finished goods. Another hinderance is that Africa as a whole has not industrialized the way other countries have. In order to have political power, a country must have economic power. This is why the biggest countries in the world are judged by GDP. The G20 are the countries that have the highest GDP. So it is essential for Africa to start producing finished goods so that the continent’s countries can have political power. In order to do this, Africa needs infrastructure (roads, power, ICT). Infrastructure will make the costs cheaper for factories and logistics. It will then help to improve consumer standard of living, which will expand the economy as more consumers spend and economic activity is boosted, expanding businesses to create more jobs. It is essential to produce finished goods instead of just resources because the added value creates more wealth. One of the reasons there is so little intra-African trade is because we do not produce nearly enough finished goods. Africa only does 10% of its trade with itself. This is ranked as worst from all continents. First world countries have built their wealth as a result of industrialization. This is why their GDP per capita is higher than many African countries. They produce high technology products. In order for Africa to do this, Africa must do the same (viz. produce high-tech products), to attain self-reliance and true independence. Intra-African trade will help Africa to reach these goals. It will also lower the costs of products as they would then be shipped from closely located suppliers; shipment takes a big chunk of production expenses for most companies, as a result, lower costs will feed profits to create more jobs. When there are more jobs, there are more people hungry for education as they want to acquire the necessary skills in order to secure those jobs. So the quality of schools will go up with increased demand and competition. This will create jobs in the construction of new schools. Intra-African trade will also connect Africans. As we do business with each other, we will learn more about each other’s cultures. We will be more interested in studying Africa than other continents. This will give Africans a better sense of self. We will appreciate and love each other more. This may even open up an opportunity for a Pan-African language that we can all conduct business and speak to each other in. So intra-African trade and the production of finished goods will have a lot of benefits for Africans. It is essential for African governments to create an enabling environment and great economic policies that will allow Africa to become more interdependent. This will eradicate poverty, raise the standard of living, increase education and increase life expectancy. Many African countries are on the bottom of the Human Development Index. Production and intra-African trade will help us climb the ladder! 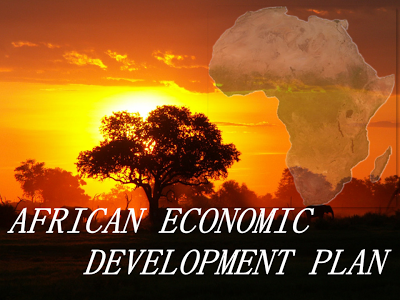 The African Economic Development Plan (www.africanedp.com) was meant to promote this course. International Monetary. "List of African Countries by GDP (nominal)." Wikipedia. Wikimedia Foundation, 31 Oct. 2012. Web. 08 Nov. 2012 http://en.wikipedia.org/wiki/List_of_African_countries_by_GDP_(nominal)>..
AFRICA, WHO ARE YOUR PROPHETS OF CHANGE?